KBSS can access the new range of air and electric torque pump. The recent new range of HTL pumps offers a very compact and efficient solution. A brand-new valve system, which replaces the old temperamental shear seal system, eradicates downtime, giving the pumps, a far greater life cycle increasing performance and durability. The new compact solenoid valve system utilises less power making this most efficient system available. 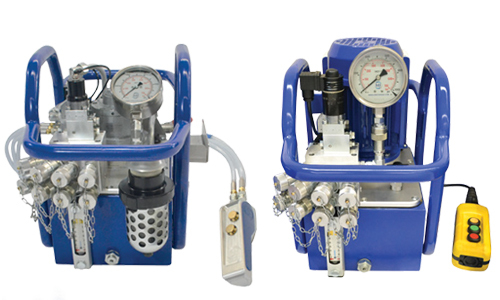 Both the air and electric torque pumps units have been designed with the operator in mind, with each pump now more user friendly and portable, incorporating an ergonomically designed moulded carrying frame. Both models come complete with four quick connect ports to enable up to 4 torque wrenches to be operated simultaneously, even in the harshest environments. Each pump is delivered ready to use and each incorporates their own unique features.